I have been experiencing an overall feeling that nothing in life matters. It’s not a bad feeling exactly, just a feeling that in the end literally nothing matters and everything is meaningless. Nothing that we do or say, as individuals or collectively as human beings, makes a difference when looking at the big picture of existence. I often feel very small, insignificant, and very much overwhelmed when I think about my life and existence in the world. It seems to me that is just a part of human nature. We yearn to find some sort of meaning in life but deep down I know it makes no difference. I don’t hope to make anyone question their own beliefs with my work. Perhaps viewers will come to appreciate their beliefs more after viewing my work because those beliefs are what gives their lives meaning. The life that clay lives when used as a functional medium is similar to that of humans. It begins life by being molded or shaped by the artist, then it is fired, glazed, and fired again so that it can live out its life until it is broken and tossed aside. So too are people born, molded into the beings they become, live out their lives, then die and are tossed aside. 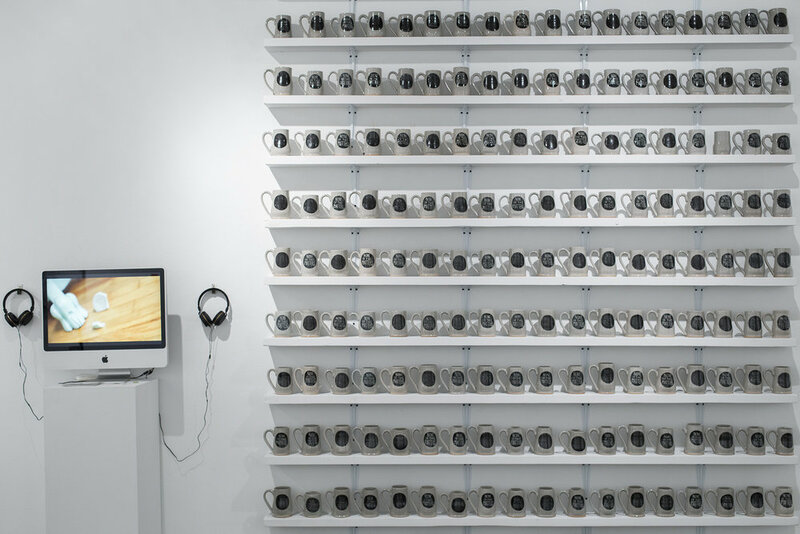 My video piece tackles this idea head on with a narrative that follows the life of a cup from before it was created, where it existed as a lump of clay in a plastic bag, all the way to the discarding of its remains after death. While the idea behind the video isn’t the happiest of topics, I have used humor in my choice of music and editing in hopes of lightening the mood. 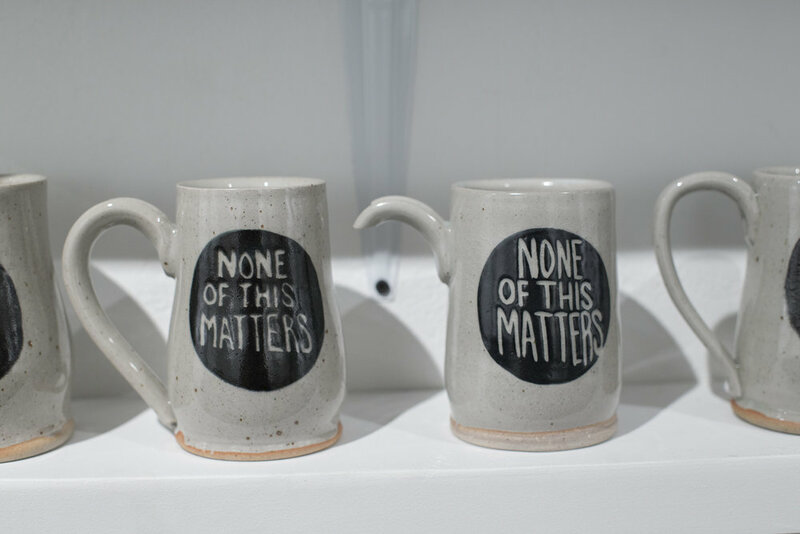 Another project that has come from exploring my feelings on existence is a series of 200 mugs that all say “NONE OF THIS MATTERS.” This phrase stemmed from discussions about my work where “It doesn’t matter” became something that I would say quite frequently. I decided to take that and create an all encompassing catchphrase of sorts. “NONE OF THIS MATTERS” is that phrase. It gets straight to the point of my feelings and is relevant no matter the environment or situation it may find itself. 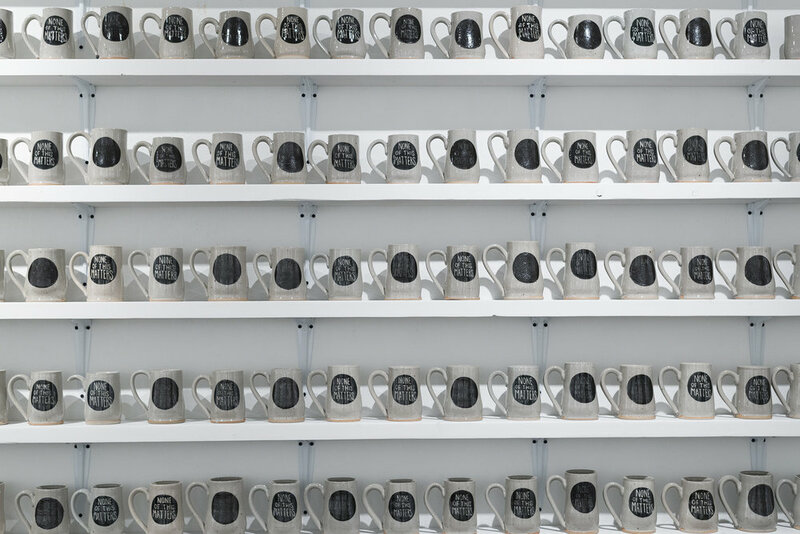 The act of making the mugs themselves is ironic due to the number of them and the amount of work that went into creating them. A lot was invested into something that only serves to remind me that none of the work I did mattered at all. Along the way, some of the mugs did not turn out as expected. Some broke while being created, some were forgotten, and others were broken after being finished. They are presented with those that turned out as expected because it does not matter if they aren’t perfect. In the end, nothing matters.